The Pacific Northwest’s leading ecology think tank, Sightline Institute, this week issued three linked papers intended to give Washington State voters an “impartial and informed” analysis of Initiative 732, the Nov. 8 ballot measure to establish the nation’s first statewide carbon tax. Ruth Mountain in the North Cascades. 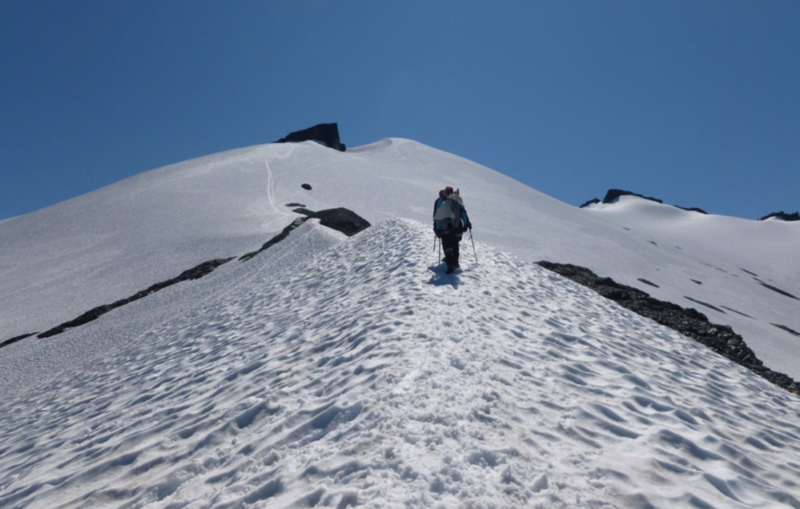 Snow was deep when we summited it in late August 1972, before the onset of rising temperatures. Photo courtesy of peakery.com. 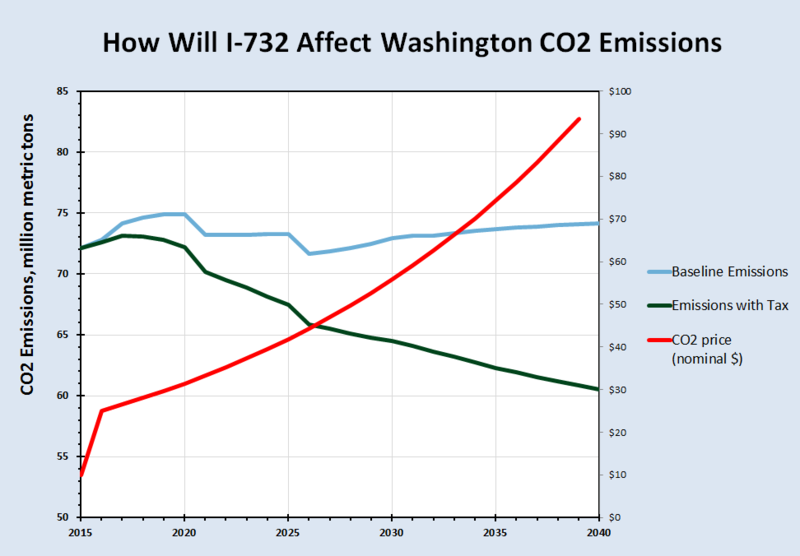 The takeaway is clear: the Sightline papers blow away the objections that for months have clouded perceptions of I-732 and threatened to capsize the extraordinary grassroots movement led by CarbonWA that last year collected 350,000 signatures and made the Evergreen State the epicenter of carbon tax organizing. Individually and collectively, these statements demolish the major criticisms that have been leveled against the carbon tax initiative. #1 validates CarbonWA’s claim that the carbon tax is economically progressive — a result of dedicating the lion’s share of revenues to lowering the regressive state sales tax, with other funds allocated to funding the Working Families Rebate — an extension of the federal Earned Income Tax Credit. #2 validates the precept that the most potent way to eliminate carbon pollution is to tax it, and confirms the organizers’ belief that establishing the first U.S. statewide carbon tax could be a climate breakthrough. #4 and #5 are icing on the #1-#2-#3 cake. Read the Sightline reports and see for yourself the care they took with their analysis and the quality of CarbonWA’s work in devising and fine-tuning I-732. Then go to the Yeson732 Web site to learn how you can donate, network, agitate and support their ballot initiative which, hands down, is the boldest and best effort yet to establish carbon emissions pricing in the United States. Sightline Report #2, Aug. 2, Does I-732 Really Have a “Budget Hole”? Seattle on the summer solstice. Crowds line Fremont Avenue in anticipation of the annual parade of naked bicyclists. Carbon Washington co-director Kyle Murphy is giving a pep talk to a group of volunteers that includes idealistic college students, veteran environmentalists, and former Seattle Mayor Mike McGinn. 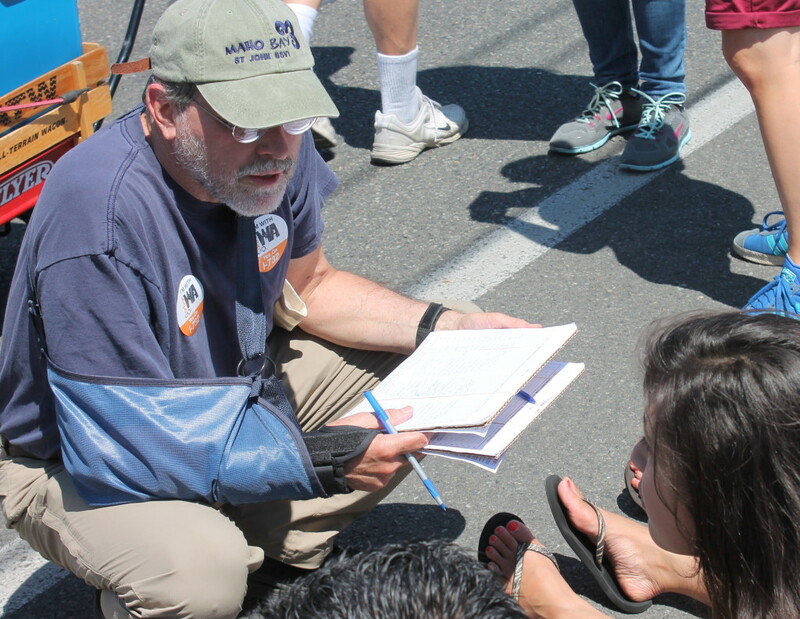 Seattle, June 2015: Petitioning for Carbon Washington. I’m helping Carbon Washington (CW) collect signatures for Measure I-732, which would put a carbon tax on the state ballot in 2016. In general, people want to participate. Almost no one turns me down. I pass out multiple signature sheets as parade-goers fumble for pens. I’m talking to eight people at once, even while competing with the naked bikers for attention. A record-breaking drought is setting the stage for a long wildfire season, and climate change is already on everyone’s mind. In a single afternoon we collect more than 1,500 signatures. The appeal of CW’s proposal is rooted in its overarching simplicity. Polluters pay, everyone else benefits. The measure would put a price on carbon emissions, forcing fossil fuel companies to internalize some of the social and environmental externalities of their business. The tax starts at $15 per ton of CO2, rises to $25 in year two, and then increases at 3.5% plus inflation annually. This long and steady increase will drive down CO2 emissions in the state. The tax is revenue neutral to appeal to conservatives. It uses the expected $1.7 billion in annual revenue to overhaul Washington State’s notoriously regressive tax code. Most of the money goes to lower the state sales tax from 6.5% to 5.5%. The 3.5% annual increase in the carbon tax is designed to carefully offset the rising value of the sales tax reduction, so that the measure stays revenue-neutral for 40 years. Another $200 million a year is used to fund the Working Families Rebate – an extension of the federal Earned Income Tax Credit. These two pieces make I-732 the state’s most progressive tax legislation since groceries were exempted from sales taxes in 1977. The third element of CW’s plan takes $200M to eliminate the state’s Business & Occupation tax on manufacturers. The intent is to make the state’s businesses more competitive and cushion any job losses due to the tax. 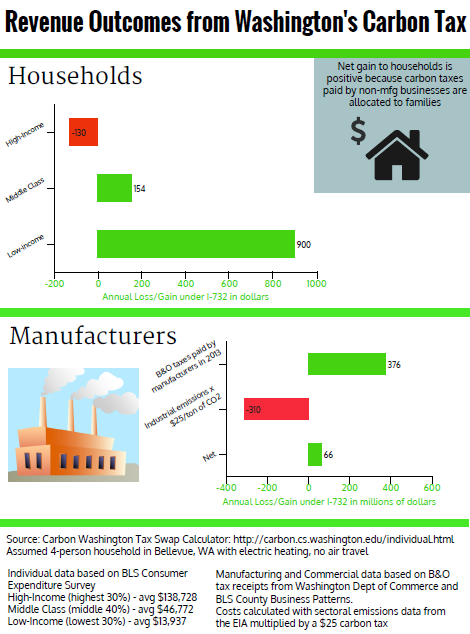 The average manufacturer will pay in carbon taxes close to what it will gain from the elimination of the B&O tax. Unlike the B&O tax, however, carbon taxes do not increase as the business grows – as long as it can grow without increasing its carbon emissions. Still, Carbon Washington faces high hurdles. A ballot initiative requires 246,372 signatures – 8% of the votes cast for governor in the most recent election. Since up to one-quarter of signatures fail the verification process, CW is aiming for 315,000. Successful initiatives, like a Michael Bloomberg-financed gun-control measure that passed in 2014, have needed to raise around a million dollars to reach that threshold. Carbon Washington is hoping to rely on an extensive volunteer network to do it for less than half the price. Still, more funding and volunteers are needed. Measure I-732 steers revenues to households and manufacturers. Assuming CW succeeds, it’ll have to defend its proposal on the ballot against the inevitable onslaught of Koch-funded interest groups. Some other environmental groups are skeptical that Washingtonians will vote for a proposal that openly uses the dreaded ‘T’ word. Climate Solutions, a regional organization, threw its weight behind Governor Jay Inslee’s cap-and-trade proposal. Despite attempts to appeal to Republicans, including a carve-out for the state’s only coal plant, that proposal failed to gain traction in the legislature. Climate Solutions isn’t backing CW’s proposal, afraid to lose what will surely be a big fight. Yet if the conversations I had were any indication, Washingtonians are receptive. They have an example to their north, in British Columbia, of a successful and popular carbon tax, so oil industry scare tactics may prove less effective with voters. In polls, support varies between 30% and 60%, depending on how the issue is framed. Victory will be determined by whether enough voters can be educated about the proposal. By talking to voters and collecting signatures one at a time, Carbon Washington is getting a head start. Is a Carbon Tax a Sensible Alternative to Subsidies? Are Energy Taxes the Answer to the Nation's Fiscal Problems?